main program – “Pikeza-4” featuring means of import and export of geological-geophysical information, profile scheme vizualisation, colour chart, seismic SEGY-file viewing; project parameter control etc. map transformation program used for binding a map-base to the ground for its following displaying on the “Pikeza-4” program. coordinate and elevation generation program that accomplishes functions of data interpolation and its laying with set interval. 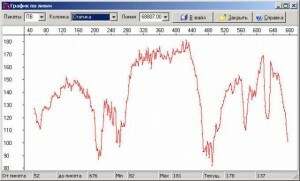 Last version of the program Pikeza-4 2016R1 0322 (March 2016). If you (or your organisation) hold a license for “Pikeza-4” software package, contact us to get the last version of the program. You can fill the form on our website, where you should tell us name of the organization, contract number; e-mail address. A link to the software will be sent to this e-mail. Approximate load size is 32 Mbyte. The changelog in software versions in 2016. [=] Changes in the offshore project. Text fields UKOOA are added. The settlement is made in numerical columns. By opening the project the progress bar is displayed. [*] In integrated plane window : Point colour fixed if the fold > 2 (the colour coincides with the fold = 2); for the fold 3 it was like the fold 1, for 4 like 2 etc. [+] storage of data about additional columns in the group project. Checkout of projects with the columns. If the group project is old, all columns are checked out into the project. The change has influence on removal of subprojects, subproject transposition, reading and writing of group projects. [+] View menu. Show only selected profiles, it is possible to set the visible profiles group for RPL and SPL. Set the diapason or one profile with semicolon. The program reorganises selected profiles adducing crossings and sorting by order. [=] View menu: show only one profile in 2D. [*] SPS import: bug Access violation fixed, if there are illegal characters in the imported file. [*] printing of maps + azimuth (the fold is opaque while printing). [+] assign the attribute – for all types. [*] group project – chromatic chart was not plot for well bores and AO. [+] Offshore projects: – Project characteristics – set numeration parameters – Column added – stake digital number (you can see its values in captions while selecting one mode) – 2 functions (main window)- set numbers to the stakes and count lineal fold (it can be shown). While calculation of lineal fold you can avoid calculatig stake numbers preliminary. [=] Profile mis-ties – gap consideration. [=] Show the number of Pikeza version in the caption bar (Pikeza-4, 2014R4 build 1113). [=] for za4 projects: the possibility to change the number of decimal digits in the “Columns” context menu of the main window. [+] New function. “Bundle” report for selected bin. It is possible to determine all RP-SP pairs for selected bin without azimuths calculation. We draw a net, count the fold, then press the key combination Shift+Alt + LeftMouse like we do for bundle formation. The text file that contains information about RP-SP pairs is created. [+] SegY parameter graph. 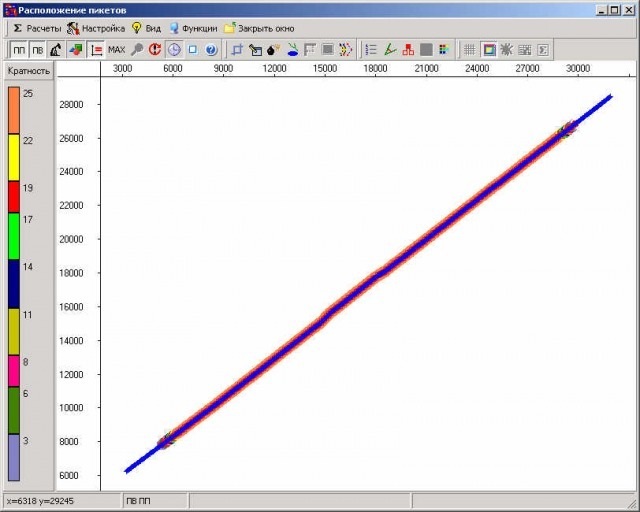 By clicking on the graph window the information about parameter value at this point pops up. [*] scrolling in segway. Now the amount of traces is accurate on the screen. [*] channel commutation – lost from menu – insert into this place ? [*] if SPS composition is called in F6 mode (lateral) and “As in a table” is set, for the current panel (RP or SP) it will be possible to write only the current profile to the file (!). Consequently, if “As in a table” is set, profile selection in the dialog (RP or SP, depending on which is current) will be forbidden for the F6 mode (only current In The Table). [*] SPS-X file analysis while import: After overriding of one of the three fields (file, string, SP) that define certain explosion file reparsing occurred. [*] transition from the main to the graphics. The graphics skipped to the top left corner. [*] SPS import. Column assignment fixed. [+] channel commutation for 2D projects (+ undo), Shooting menu – commutation. [*] Palette and Clipboard ( because of CHAR size it becomes UNICODE). [+] Group operation in editing (Group identification shift is possible in RP or SP group shear, in SP group shear spread compensation as well as new mode (split spread) is possible. 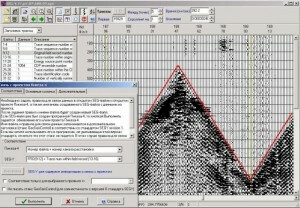 [*] With large amount of traces overflow while azimuths calculation and data displaying on graphs and diagrams appeared. [*] There was an error while lateral displaying (F6) with any number of profiles and particular left panel construction mode with profile numbers. [=] map management window scales and its size is stored. [=] full map name is also displayed in tip when you drag the mouse over a non empty string. [=] After mis-ties calculation the window with information is opened. [=] In dialog while recording SPS-X file the SPS2.1 checkmark was not ticked. There are file numbers in the table which contain moe than 4 digits. [*] 2D report: if new SP track is shot (there is no track in SP table) but shooting track RP already exists, new RP in false coordinates are not added into the table end. [*] While 2D report with reverse RP pitch shooting in split spread the stakes branch was defined inaccurately if there were no more stakes in the branch. [*] “Spread editing” window. “Change” did not work, if the information only about disconnected channels in the spread, which did not have disconnected channels, changed. [=] “Integrated plane” window was arranged. The tooltip while scroll-bar movement appeared. The changelog in software versions in 2008. [+] Label printing onto 1 sheet of paper and on a scale. [=] Well bores and Others are dispayed on the colored panel as well as SP-RP; operating X Y Z are equal for all types and additional columns are unique for their type. The changelog in software versions in 2007. [*] If S-import and stake already exist, double explosion will not be produced with absence of coordinates in present stake although it is situated in S-index >1. The coordinates are overlaid. [! ][+] Mega-projects – providing different stakes for projects that are included into mega-project. Project format was changed, old formats are not maintained. [*] In SEGY module additional check is made: while defining trace number for particular SP if description number for disconnected traces > number of these descriptions (in project =0), then think that there is no missed traces. [*] SEGY. Traveltime graph drawing before the last visible trace. [*] SEGY. While file reloading the exception Scroll Bar Property.out of the Range could appear. [=] While coordinate transforming – symmetry of X, Y + shift X-Y — change angles of slope. [=] By random coordinate transforming angles of slope and distance are to change. [*] RP text import – by mistake or in SP line. For RP there are only two choices (in project characteristics) – replace always of replace only without data in the existing project. [*] Accounting the RP profile slope in “All spreads” function. 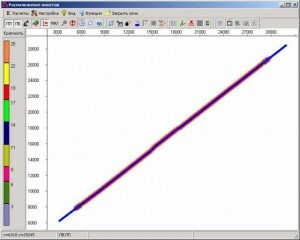 If RP profile slope is not set then SP visualization is impossible. [+] “All spreads” function – visualization. [*] Operation Ctrl-X worked incorrectly in Line column: all profiles were deleted but the information about stakes with the same numbers was left. I was found out while column replacing. [+] Possibility to apply the changed existing spread to all SP with this spread and delete the unused one. The UNDO error for this situation was fixed. [+] Possibility to shoot projects where the grid is set (or there is enough data describing the grid) and SP lines are registered only on one line so that the shift is made to the SP lines that coincide with the grid settings. On these conditions this mode is the basic one. If during the work another mode was set (taking additional perforation into account), it will be remembered for the next log on. [*] Input prohibition of arithmetic. [=] Spread edit. The button “add” was replaced by “input”. It input a new row after the current. [=] Possibility to set characteristics to captions (in “setting of graphic window” menu) – fond, transparence, background. [*] Building diagram using track. If the value is not defined, for the integral valued (files) the necessary value was considered to be the number (as a minimum 4-byte integer number). It was a mistake. For real numbers the value was replaced by 0. Now for all types either the minimum value is registered or 0 (if it is not defined or it is less than 0) if the values us not defined for the diagram. Besides, all undefined values are spotted on the horizontal axis. [*] SGY — checks during the work with a floating point. [=] Sorting according to any two characteristics. “Line+Stake” button has changed. [*] Improve SPS creation analysis for two explosions. Either the first one or the others can be turned off (and they are not to be recorded). Recording SPS use the pattern: Successiveness as in the chart – record the double at the end. The error while recording of the double was corrected. [=] During CS load from the file cancel the whole load if something particular is cancelled. [*] Numeration while creation a crooked line: if numeration was set in the project, it cannot be changed in the track creation window (it can be non-integral or <0); if it was not set, you can set any (numeration will be set after the first track creation). If it is necessary to set numeration that will differ from the project numeration, it can be done in project characteristics. [+] Group project — possibility to add captions that belong to the group project but not included in subprojects. When creation and editing we see only group project captions. [=] Group project — Show cartographic objects and captions only of marked subprojects! [=] When a projects is switched over from 2D to 3D or vice a versa, fold is checked. If it is present, all fold data is deleted from the cache. If Setting window opens while import or shooting to update steps, project switch over is prohibited. [*] When an integrated plane is set and numeration step is >1, not the whole range will be shown. [*] While setting an integrated plane, vertical size of a window was incorrect when RP numeration step was not 1. [*] Error with Undo while group operations with the line on the panel (move, fill in, delete, paste, arithmetic, interpolation). [=] Azimuths for a Reflector. Warning on the menu panel. Fold format was changed. In the Reflector flat data is recorded as well as in the file with the fold. If the fold was calculated with a reflector, then Warning and Check in the menu are shown. But only when the project opens or the user clicks on the icon to show the fold. If you remove the Check from, fold data is removed as well. [*] It is prohibited to delete the first row of a spread. [=] Specification 4.6.23 — the tabulation in SPS is not possible. If it exists, the message that ts is error appears. [=] Optimization performance in the work with uploaded data. File data that are uploaded in RichEdit to show them, are also recorded into TStringList (LoadedFile). [=] SEGY: Scrolling cursor sizes are proportioned to the amount of the shown traces and time. [=] Spread window expands vertically according to the number of rows. [*] RP was defined incorrectly by Explosion and Trace number in a spread if the spread was not orthogonal. As a result, invalid data was recorded in SEGY. [*] When export is set, a message about absence of polylines appears. [=] First stage of seismic acquisition system files import. It was reorganized to rule out suspensions; messages about errors are shown after closing the window. Horizontal tab conversion was added to the space pack. [=] АРАМ import — the double are taken into account if they are described in USEPAT. [*] Coordinates conversion – messages did not displayed on the foreground. [*] It is necessary to mark the selected group in the report manager. [=] Closure of the graphic window. The situation with public edit mode was processed incorrectly. [!] Information about distance is recorded in the project (for two panels). The project format was changed (28). [=] Creation of the message that a project created in the new version opens (if project version > program possibilities). [=] Report manager – remind to save edit data. [*] When modeless window opens (comments, Segway, two import types), all information about this window is to be recorded in the Windows menu to shift there. [*] Minimizing is possible for all modeless window; that is why if these window are called it is possible to recover them in the standard form. [-] «Save» button in the comment window as the information is now recording directly in the file. [*] Text import: check whether all necessary columns are set when last string or last stake import was set. Text import: write zero. [+] Menu in Integrated pl. and Graphs-diagrams bound with colored panel window are identic to graphic window colored panel. [*] Error in calculation the number of stakes in the polygon. Removed were also calculated but the removed were not worked with and so an error appeared. The removed appeared while re-setting RP grid. [+] Palettes and work with them. It is possible to download the palettes. [*] It is prohibited to create a column with the name Distance (or rename it), as well as X_old Y_old. [=] Dialog of master value and threshold setting is made. Defections are colored. [+] “Distance” function in edit menu. If there is no additional column Distance in current panel (Shot or Rec), it is created; if it is text column, it is transformed into numerical one. In Distance column distance between stakes with adjacent numbers is written (it is blank for the first stake). UNDO can return after this function. [*] If an additional column was the text one and it is transformed into the numerical one (e.g. 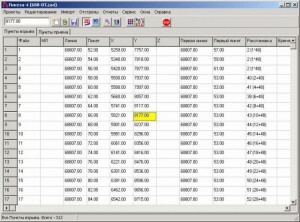 “Distance” column), it is transformed with an accuracy of two decimal points (default accuracy for add. columns. [=] Comment file – not necessary open the window – if file name is set, strings are written into comment file while string deleting. If the window is open – they are written not only into a file but also into a window. By editing manually it is saved by clicking or by closing the window, or by writing new data from import window. [=] Reports for text file import (and communication buffer). Two types of reports: (a) MS word formated; (b) text file. [*] SPS group import. If it was necessary to send an inquiry + take index into account -> there was a mistake in index number analysis if there have not been explosions yet. Refuse from Quick Report. SPS group import creates Word report. It is slower when there are many strings but it looks better. Shooting automatically if stake and/or string numeration step is negative. Shooting with offset, wizard realization. Channel disconnection as positive and as negative step. If stake or object color is white (background color), it is considered as there is no background drawn. 2d — RP and SP setting in wizard. Now the hole in the middle (offset in split spread) and cannel disconnection (hole+channel disconnected) are not ready. As there are holes and inactive SP, there will be M again after shift. By switching over the panels in program properties display a status-string for the last two. Setting for graphs and diagram. Printing the captions to stakes by scaling print. BIN grid is maximized to capture stakes and editing grid is maximized by stakes, well bores and OO. Well bore and OO edit — creation. Scaling after stake and well bore creation in graph. window (edit) – project boundaries and scaling are recount. Due to data storage specificity it is necessary to storage information about displayed image change (which inner string in the panel coincides with visible string). Another analysis was added to invisibility of these values in UNDO stack. And if the last action is explosion number visibility change (ENVC), the program will scan stack until it meets another action. Earlier saved ENVC actions were tested by UNDO to be deleted from the stack and ENVC action was displayed in menu if it was the last action. Now the first not-EVNC action is displayed, all ENVC and the first not-ENVC actions are tested while UNDO. But if ENVC action leaded to filling the buffer in IP then the program cannot (for now) go through the stack and find the first not-ENVC action. In this case ENVC will be in menu. While spread creation restriction on stake sequence is removed by hand. Error while making report for bin group. It appeared while function of partial azimuth downloads. Now when Pikeza-3 project is opening, it is possible to open P-1(*.zak), and P-2 (*.ZA2) ZA1, ZA2 and ZA3 in caption. For Seis2d projects variables necessary for IP construction are initiating. After it is saved in a right way it is possible to construct all IP because all SP-RP with the same number in Seiz2d coincide. Error, when RP-track did not exist in reality but is present in the spread, it was displayed in SP-RP pairs while IP construction, is fixed. Error. File number was generated inaccurately while shooting if there are shootings in this project. MDB -New format. Creation of MDB-file by special handlings, pattern is not necessary. Realisation of UNDO for MDB actions. Information restoring in MDB-file after explosion removal and reconstruction, spread change after many different operations. While saving the project from MDB file information necessary for MDB-UNDO is deleted and only the last one is displayed. After SaveAs or rejection to save information from MDB file that is necessary to MDB-UNDO is deleted and information that was saved for each explosion before opening the project is saved now. Add a project – function is changed in mdb combination. Now throwback to MDB is possible. [=] Call of connect to mdb is updated. Default database is not necessary to write. [=] Change of caption characteristics – binding comboBox is in the grid now. [=] Draw binding point for captions in cart. object mode. [=] Button “Fold” is disabled for subprojects (group project) if not a single fold file exists. [=] Terminology: There was MEGA-PROJECT somewhere in the messages. Change it for group. [=] If a C-Object already exists in the file, do not write it at the end. [=] Caption recording to the file of C-Objects (option in menu) and reading. Cartograph.Objects class cannot be named _Label_. Possibility to change caption binding type added (caption edit window re-made). [*] Errors connected with caption removal fixed. [=] SEGY view. First trace display algorithm while line scrolling improved. Now a valid trace number is displayed after cursor stopped. [=] In viewing window coordinates are displayed while cursor moves. These are coordinates that coincide with the point where cursor stops (X and Y). [*] While call of the project by double clicking with extension .za3.za3 it was defined inaccurately. [*] Error is bound with adding mega-projects to the list of the last projects. [=] Search in the column: Hot keys Ctrl-f (whole column), Сtrl-G (down), Ctrl-Shift-G (up) are inserted. If there is no search in this panel or it was in different column, the dialog window opens (while call through hot keys search view is set immediately). If search in current column was the last one in the current panel and function was called with the help of hot key, search is called immediately, without the dialog. [=] Acceleration of panel deleting. Now objects deleting is faster because of special period insertion. [*] Error while deleting captions on the map. Change of work with captions, operation can be cancelled before closing the dialog. Editing of captions coordinates. [*] Information about numbers of well bores and other objects was recorded into the file inaccurately (in mega projects that were created in other versions number of well bores and other objects in the main window was displayed inaccurately). [*] Error in stakes deleting. By UNDO data in memory was spoilt after the project was added – If other project was re-uploaded, the error appeared. [=] movements at tabulation so that focus changes from the left to the right, from the bottom to top but not moves chaotically (including DLL). — if memory for az-rem is lacking (>160 mln), then calculation is made by several steps (their number depends on the highest part of memory accessible). This situation can be seen while calculation: Azimuth calculation (1 of 3) => etc. Several steps with recording into the file are made. File structure is the same as while one step. If all data for SP (CDP) are in the selected area, then by the next step this SP should not be analyzed. — by displaying az-rem, CDP, beam – only necessary part of all azimuths is downloaded and you can cancel the download. If too many az-rem and CDP are shown (more than the highest part of memory), only the ones that were downloaded are shown. So while displaying both the beam and az-rem or CDP beam can be unshown if az-rem-CDP require too much. While displaying the beam (without az-rem-CDP), it is always displayed. — while setting a function or a report drawing process closes (if azimuths, CDP, beam were set in drawing, then the function can restart azimuths-removal and the drawing will be failed) and after performing functions returns back. — bin net, fold, azimuths, beams. While closing window everything that was done in some regimes (shooting, edit etc) is not remembered. [*] By displaying of data about well bores and other objects X-Y-Z were not displayed by clicking Shift+mouse. [*] Calculation of interference of polygon with visibility orthogone. [=] Coding of ebcdic into segy. Sometimes problems with Russian names existed. [=] SEG view. Prohibition to call window upload function before uploading new file. [*] By tracks and strings drawing you should define points of interference with the orthogone (visible area) first and then draw. [=] Debugging message inserted (Internal error) if number of visible and double stakes with inner ones does not coincide. [*] While building colored panel and calculation of MIN and MAX removed stakes were taken into account wrong. Color panel was built accurately only after the project had been saved. [*] By UNDO call from colored view you should upgrade colored panel because values beyond colored panel restrictions can appear. [=] SEG-Y — binding on another field. Two binding types in SEG-Y. [*] If RP numeration step is <0, then arrangement were not shown but now they are; possibility to move while shooting planning; shooting manually or automatically. [=] SEGY-Project binding type choice. (2 possibilities). [=] Processing of incorrect data while import. If output was set in dialog, now while output to dialog you can set that following errors are to process the same way. [=] 2-coincident and other way. Change the cursor (sandglass) during operations. [=] If in sequence overlapping mode it was found out that all explosions had already been done (more data in file than in project), then text “Data sequence is more than in project” appears in dialog. Use can take an action manually and continue. [=] Checkmark “Continuous overlapping on the double” appeared in dialog during the import (when one double stake already exists for imported stake). This situation is processed for text file import, file-seismic acquisition system and dialog X-SPS import, group (S and X) import or SPS-S import. “Do NOT take index into account” should be set (except the text one). [=] By search of a number in column it is transformed into the format of particular columns and then searches full-coincident strings. After a number is found the column is set as the current. [*] In DLL — transfer to string while import function (by number in the file). Error appeared if number is >999. функция переход к строке (по номеру в файле) при импорте. Ошибка если номер > 999 System function divides every three characters (by space) if you click Up-Down. Now the program takes it into account. [*] By SPS-x import if there is “Ask a question” in characteristics, this question and question “Create the double” will not be asked after output to the dialog and settings because the program thinks that the double will be created always if there was an explosion. [*] SPS-Explosion import error. While import with several explosions on a stake, index was analyzed incorrectly. Now stat and depth are written correct in this situation (checkmark “Do NOT take into account index on the sps-file group call” is absent). If all stakes have almost same coordinates (and the difference is in the project setting) then there won’t be any problems. [=] Realization of explosion number is in a dialog while import. If there are several explosions in the stake, you can change explosion number. [*] By text import to the existed double explosion program did not open the Dialog if the import mode “Change” or “Add” was in. [*] HCN dependences for information file call from the program were upgraded. [=] Search error in blank table. [*] Errors in SEGY by processing the recording into or from the project appeared. If processing is set and SP is not found for current trace, it was missed. By sorting first trace number was not set. The last trace was never endorsed. 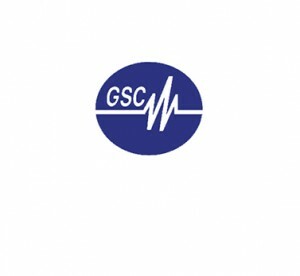 [=] While forming without GSC stanza suggest writing *.sgy, or in stanza — *.sg4 by default. [*] Project addition – error while realization mega-projects, both functions (adding of project data and addition to mega project are being done the same way first) added. [+] Do not write GeoSeisControl stanza. [*] Well bore and other objects names were not recoded while P-3 project opening. [*] Error in entering the polygone (while working with area border) if it is situated on the border. [=] If the mistake in project is found while opening the project automatically, second-to-last in list of last opens. If project is absent (deleted), the situation is the same. If there are no projects in the list of last, then a new one opens. Messages are displayed when the setting “Open the last one” was set. [=] Possibilities to draw a measuring rule while printing axes that have equal scale. [*] If there is lack of memory on the disc while recording azimuths, a message is displayed and a file is deleted. [=] If recording azimuths into the file or azimuth drawing is in process while storage deallocation from azimuths, wait (synchronization). [=] Now while SN388(488) import it is possible to set two add. columns (Uphole, Depth). If there is nothing to select in the window, after clicking “Set” setting is cancelled. [*] Import errors: In SN388 first string with data was missed by analysis. [*] Error while import of column at the end of the string. [*] While restart of a project stack UNDO was not cleaned. [=] Completion percentage while sorting in the table is added. [*] While recording an image into a file (graphWindow) an error exists – it is necessary to scale according to set image size. [=] Area graphs were not drawn if there was not reference for fold/azimuths; while area scaling in graph. window old algorithm was used in the moment of bin setting; number of bins or traces in status string. Now the diapason includes borders. [*] displayed area of graph. window was not changed after quitting this mode. [*] incorrect tetragon was drawn if you clicked and released it of several times. [=] Decrease number of upgrades while turning on/off the visibility of SP-RP-well bores-other. [=] Button for “Area borders” added. By clicking the whole border is deleted and it is possible to draw a new one. If there was no border, it begins when you click this button. [=] If buttons (border, CF, CF outline, captions) were pressed, it is displayed immediately in comparison mode. [*] Border in comparison mode was not displayed. [*] Area fold for 2D was calculated incorrect. [*] Comparison. Displaying of 2D lineal fold and move from the areal to lineal fold mode and back did not work. [=] Azimuths in comparison mode: different variants whether azimuths have already been displayed or not etc. [=] In the second project it is possible to select a stake and scale it. [=] If you select non-coincident stake in the second project and then another one, then color of selected one will be color of non-coincident one. [=] In colored panel mode write a value that coincide with the color in the status string of the second project while stake selection. And vice versa. [=] Cancellation of CDP drawing by clicking ESC. Cancellation of hints while drawing to escape repaints. [=] Pointers and captions for CT.
16.02.2005 [*] If stakes cannot be seen while matching to the grid, error appeared. After first matching new matching is to begin where previous matching ends. 14.02.2005 [=] When you enter cartographic features, edit, shooting or binding, fold, azimuths, bin, CDP, beams are to remove. 14.02.2005 [=] Comparison of projects: change of window size, check of opportunity to compare projects (if less than half of stakes does not correspond, there will be no comparison), shift is calculated at compared (averaged), scale synchronization. Move to the color mode and back. Fold, azimuths, CDP and beams are blocked. Development of all colored panel modes, size and stake colors, captions, stakes visibility. 10.02.2005 [=] identification change: if the user sets six parameters for panel by hands (RP numeration step, RPL, Rust between strings, Rust between stakes, strings slope, stakes slope) and then selects matching the grid point to stake (RP!) mode, stakes identification change is possible for RP. User is responsible for everything, e.g. identification change corresponds to the shift for the stake which angle is matched to. 10.02.2005 [=] If “Redraw immediately” is not selected automatically, do not redraw it for all color panel functions and vice versa. 10.02.2005 [=] Comparison of projects (GraphWindow-functions), possibility to open only the second project yet, synchronization, closing. 09.02.2005 [=] Breakpoint stake display. In GraphWindow: Settings-colors-BP, Settings-Distance-View-BP. 08.02.2005 [*] If Shift is pressed while moving to GraphWindow, caption below the current stake in the table stays (no matter whether GraphWindow was closed or open). 08.02.2005 [=] Before closing GraphWindow calculation should be finished. Otherwise the message is displayed and window will not be closed. This situation can appear while drawing the fold, azimuths and removals. But in this case the window won’t be closed (without messages). 08.02.2005 [=] First step of “Creation of breakpoint” function (“Service” menu). Columns X_old Y_old are created (if they are absent) on two panels. They are filled from X — Y. Creation of this columns be hands is prohibited and removal is allowed. UNDO works. 07.02.2005 [=] In Seg parameters possibility to reduce is added добавлена возможность уменьшать разреженность. 07.02.2005 [=] On the same editing session editing grid can be reduced. 06.02.2005 [=] Azimuth calculation (a little faster) and settings (redraw immediately). 06.02.2005 [=] Track creation mode. You can stop and change scale by right mouse clicking and then continue drawing. 02.02.2005 [=] “Remove azimuths and removals from IP” button. 02.02.2005 [=] With SEG with ProjectB synchronization check matching time is also stored. If after matching something is changed in the project, warning about desynchronization is shown while opening SEG. 02.02.2005 [=] SP-RP numbers (not coordinates) search is added into report on Beam on one bin. It is set in the window. If the option “Report with SP-RP numbers” is set, the program searches in SP and RP coordinates and prints pairs of SP-RP for bin set, not the coordinates that are calculated with CDP. 02.02.2005 [=] Bow conditions for Beam will act only for one bin if you don’t click on “Change settings” but click on “Change checkmarks”. 01.02.2005 [=] While lack of memory in SEG-Y, IP building, Track graphic, Mark, Huge import requests memory is released and Graphic window is closed if azimuths-removals were uploaded. 01.02.2005 [*]F6 mode error. More than 65535 stakes were not foreseen. 31.01.2005 [*] Last algorithm fold calculation error is fixed. This algorithm is prolonged for mega-projects and azimuth calculation. 30.01.2005 [=] From this version on number of traces has also been saved in fold file (without changing ZF_ format). 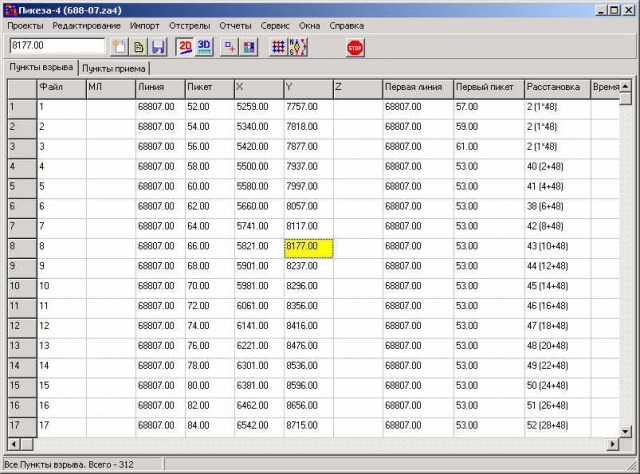 Number of traces is displayed in general report. 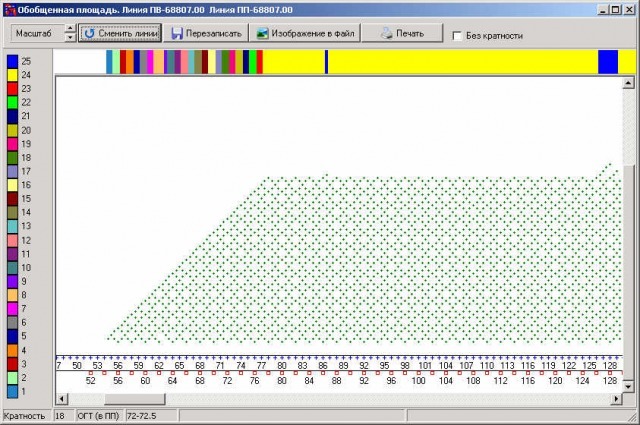 30.01.2005 [=] fold calculation acceleration at stake search point on the second and next spread strings. 23.01.2005 [*] After group removal track stake list tables were built inaccurately. It led to TMN050116. Error was set by group removals acceleration. 19.01.2005 [=] Don’t analyze distance between stakes while text file import if the number between points in “Distance” is >=100. In this case equality SP+L is enough for coincidence. 18.01.2005 [*] If program option “Show message while closing the window” was set, the program always saved project even when there was no changes in UNDO stack. 10.01.2005 [=] SEGY: segy record. Stanza p4. 08.01.2005 [=] SEGY: options of connection with P-4 project. 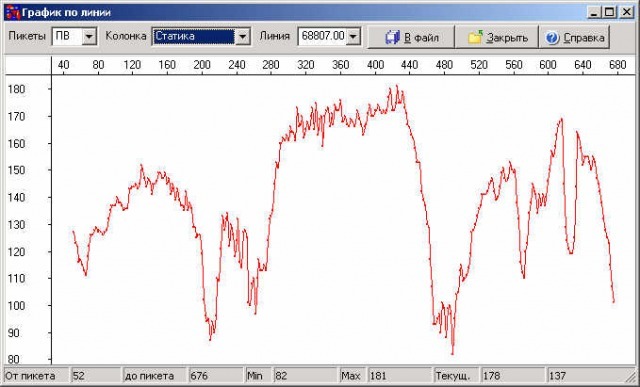 08.01.2005 [*] SEGY: remembering current parameters values. 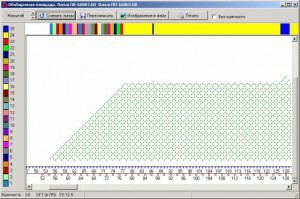 07.01.2005 [*] SEGY: error in trace drawing in the right ошибка прорисовки трасс в правой части экрана. 07.01.2005 [=] SEGY: visualization — fill positive. 07.01.2005 [*] SEGY: determination of trace captions after the first. 24.12.2004 [=] Dialog of adding LYM map transferred from dll to exe. 18.12.2004 [+] SEG-Y Outer window view. Files captions reading. Transfer to new window from “Service”. 18.12.2004 [+] SEG-Y window public facade. File captions reading. Link from Service to the new window. 15.12.2004 [*] LYM download. Error. If both LYM-file and Graph.file belong to the same directory and it is not current, it is necessary to add a path while downloading the graph.file (in LYM file name is written without path). If it is absent (deleted), message should be sent. 15.12.2004 [*] If LYK-LYM is not found, message is shown. 15.12.2004 [*] Printing error on a scale fixed. 14.12.2004 [*] Bug appeared with RC17 fixed (P3 reading if there are too much 2nd). 14.12.2004 [=] Splitting of the double ones into the coincidental ones is made. 12.12.2004 [=] Not more than nine double explosions for the same stake. If there are more explosions than nine while import from P-3, then the next stake etc. More tests necessary. 06.12.2004 [=] Synchronization: when you open the additional mode (Additional perforation, Edit …) “Profiles grid” window should be closed. When you pass on to the main window you should close additional mode if it is open. 06.12.2004 [+] For Brick: -Alternative spread — way through PI can be unset; -Insert SP into PI calculation (as current PI is set as the last marked SP and if the mark is deleted then as second to the last SP) – In status string information about SP in the PI is displayed. 02.12.2004 [=] While recording parameters into the register, consider them as parameters by default so in the current session use this data to create new projects. 02.12.2004 [*] “Panel adding” appeared in new projects and in UNDO list of P-3. 29.11.2004 [=] Dialog of script-report setting was changed and possibility of data selection and its sequence appeared. 29.11.2004 [*] key in RootDir register is made for defining the directory set. It is used as a link to Help. 26.11.2004 [*] While spread movement mistake could appear if the stake coordinates were not set yet and they were selected. 26.11.2004 [*] Translation. There is not a single known Russian text. 26.11.2004 [*] While spread planning it was taken into account that moving of RP\RPL by zero can be set. 29.09.2004 [!] Changes in calculation algorithms. Speed increase. 27.09.2004 [=] New fold calculation algorithm. It is used only in “Fold and azimuths calculation” menu yet. 21.09.2004 [+] Types of fold and azimuth project files were changed. Recording is made in one file while saving. 01.09.2004 [*] Now import stops when the steps do not coincide. 27.07.2004 [*] Import — Seismic acquisition system files — With type recognition. Import error if the steps were not set, fixed. 22.03.2004 [=] Panel “Additional functions” is now accessible in “Edit” and “Shooting” mode. 11.03.2004 [=] While track creation take into account that RP step has already been created or create and fix it. 11.03.2004 [=] If there is at least one spread in a project, stake number changes only in project characteristics. 11.03.2004 [*] Renumeration of SP + SPL, RP + RPL error. 11.03.2004 [=] Program settings: Double – Coincident transformation. 09.03.2004 [+] Project merger: recovery by error. 25.02.2004 [+] Displaying of “Caption” string on the import information window. 10.02.2004 [*] After CF change the project size has to be recalculated if CF define the size. 06.02.2004 [*]Error “It cannot be” in cartographic feature. — ошибка «Так не должно быть». Polygon bulge was defined inaccurately because of computational error. Requirement to computational error was lowered. 06.02.2004 [*] Program does not check the presence of file before moving to notes. 05.02.2004 [! ][=] Structure of mdb-file was changed (identification by unique number (UID)). 03.02.2004 [+] Synchronization with mdb-file by renumeration. 02.02.2004 [=] Dialog of SPS additional field setting was also transferred to “Project characteristics”. 02.02.2004 [-] Now scrapping is deleted while stakes renumeration if “Delete mark by spread change” is turned on. 02.02.2004 [+] Spread: change the spread in the window “Marks” while channel scrapping (see format change of 28.01). 29.01.2004 [=] Project characteristics: RP numeration – requirement to accuracy lowed. 27.01.2004 [=] “Wipe” function: While any operation that leads to wiping “Spread”, “First string”, “First stake” values, spread, first string and first stake are wiped immediately. 26.01.2004 [*] Graphic window can be maximized coincidentally with curvilineal track coordinates. 26.01.2004 [+] Creation of curvilineal track by means of a cursor in Graphic window. 26.01.2004 [! ][+] Project label added. 25.01.2004 [+]Creation of curvilineal track by means of a table. 25.01.2004 [=] Creation of SPS-files: opportunity to sort “as in SP table” added, setting of double SP arrangement in a file. 25.01.2004 [=] Reading the information about reverse commutation while opening Pikeza-3 projects. 25.01.2004 [=] Open comments file automatically if it was set once. 23.01.2004 [=] sps-x import: explosion index analysis. 22.01.2004 [+] “Service” menu expanded – call of outer programs. At first the file is searched in ApplDir directory (it is register variable in section of Pikeza-4). If there is no variable, then – into RootDir. 20.01.2004 [*] undefined mark can be set from the main window, it is saved by report manager. 19.01.2004 [+] Spread: changes in analysis of interference of intervals with one string (number of missed channels and stakes is analyzed). 15.01.2004 [+}«for setting.mdb» file for report manager. 13.01.2004 [+] Options «replace — leave old information” for X-file and seismic acquisition system. 13.01.2004 [+] View-Tracks menu – track management while viewing. 08.01.2004 [+] Arithmetic with calculator.